Prior to conservation, the lacquer was beginning to break down on this piece and it was beginning to tarnish. 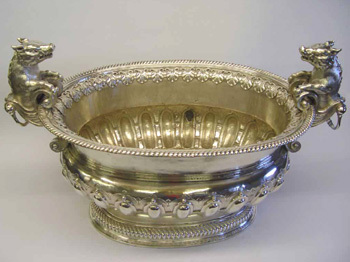 The old lacquer was removed and the silver lightly polished. The entire surface was then degreased before applying a new lacquer coating. Now it will only require minimal maintenance - lightly dusting with a pony-hair brush and re-waxing the interiors and handles when necessary.